Come make new friends and learn about all the fun you're about to have in Houston and world-wide hiking, biking, traveling, kayaking, socializing and whatever we can come up with that’s fun! 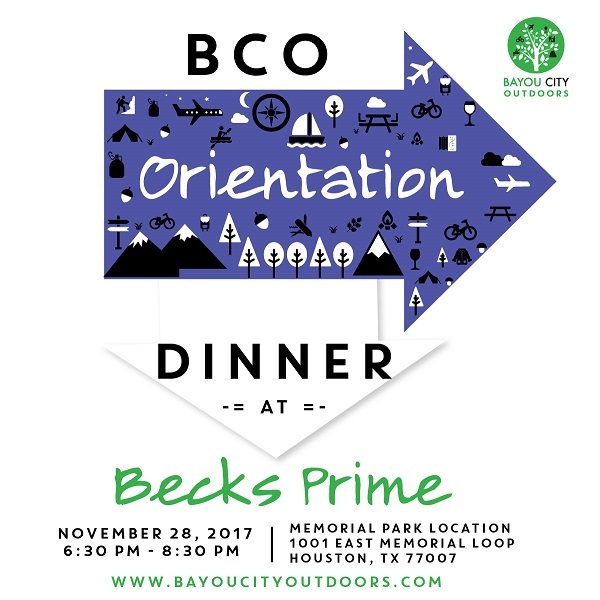 Are you new to BCO and curious to discover the ins, outs, and what all a social, outdoor activity group like us has to offer? Have you been stalking the calendar for months (or years) and haven't joined yet... maybe you just have a few more questions? Or, you're already a member but you might need some tips on navigating the website, or you're still a little nervous about attending an event or outing alone. Just want to come say hi? Do it! You'll meet folks in the same exact boat as you, and you'll learn a whole lot about all the fun Bayou City Outdoors has to offer. Our calendar can be a little overwhelming with 80 to 100 events every month, so let us explain some of our favorites and tell you everything you need to know about being a BCO member. We'll fill you in on the perks, discounts, loaner gear, buddy program, website, RSVP system, tips and so much more. We work hard to make this a little more “formal” (if we could ever be accused of that!) than our Meet & Greets. Time and size permitting, we will have a presentation, Q&A, and social time too. We may even have a few Event Leaders on hand to talk about their upcoming events! There is no charge for the event, but you do pay need to for your own dinner.